Crossovers are kind of the ultimate fan service. The actual story beats seldom add up, but fans are almost always excited by the prospect of their favorite characters meeting. Many of them care less about the details of how these universes wind up occupying the same space and more about just somehow seeing it happen. Every once in a while, the circumstances leading up to these epic situations make sense, but those instances are few and far between. Even still, there is something undeniably delightful in seeing your favorite fictional worlds collide. There are certain TV shows that lend themselves to these events: Buffy the Vampire Slayer and Angel, the Arrowverse, or Grey’s Anatomy and Private Practice come to mind. The spinoffs were created with crossover potential in mind. However, television has also seen its fair share of team-ups that were far more difficult to imagine. No one really saw a Bones/Sleepy Hollow mashup before it happened or considered The Fresh Prince of Bel-Air showing up on Blossom. The latter was a particularly strange choice if for no other reason than the fact that Will Smith had previously appeared on Blossom already--as himself. As crazy as some of the ideas that actually made it to the small screen are, there are also plenty that didn't even survive the pitching stage. Some of these actually wouldn’t have been all that much of a stretch, but others were far cooler in theory than they would’ve been in execution. Her are 20 Canceled TV Crossovers That Would Have Changed Everything. Supernatural has proven time and again that it’s not afraid to try new things - with results ranging from amazing to awful and pretty much everywhere in between. Although the series shared little in common with Smallville, either tonally or storywise, both were successful CW shows with incredibly passionate fanbases that happened to share a network. It seems only natural that plans for a crossover were at least considered. In typical Supernatural fashion, the pitch was not what you might think. It’s wouldn’t have been the Man of Steel that the Winchesters came across, but rather the actor who portrayed him. A curse striking down former Superman actors would lead to them to search for Tom Welling in the hopes of protecting him. It’s definitely a cool idea, but one that never wound up taking shape. Would Jensen Ackles have played Jason or Dean? While it is true that a crossover between Riverdale and The Chilling Adventures of Sabrina may still happen at some point, there was initially talk of the character making her debut on the former. Back when Riverdale was still searching for its audience in season 1, the idea was to wrap up the year with Sabrina Spellman appearing as a villain. Following this development, the next season would take its cues from the more horror-oriented comic series, Afterlife with Archie. Of course, these plans were abandoned after Riverdale found its footing. Once the series had established itself as a noir, it would’ve seemed too strange to introduce magic into that world. For the time being, Greendale and Riverdale will be remaining separate entities - but fans are keeping their fingers crossed. As previously mentioned, a crossover between two shows doesn’t always make much sense. Due to the immense popularity of both Seinfeld and Friends in the '90s, their shared network of NBC had high hopes of finding an excuse to unite them for one epic event. It might’ve actually happened, if not for Seinfeld co-creator Larry David’s intense desire to make sure that it never did. Following David’s immediate dismissal of the idea, Seinfeld writer Peter Mehlman suggested telling NBC that they were a go, on one condition: Ross wouldn’t make it through the episode alive. Although both men found the pitch hilarious, they knew that their terms would never be agreed upon. It’s probably for the best, even if many fans of both series would’ve enjoyed watching that particular story play out. Imagine being approached by George R.R. Martin himself and asked to create a crossover with Game of Thrones. That was the dilemma faced by Westworld showrunners Jonathan Nolan and Lisa Joy after the famed author suggested just that. Fans had been floating the idea as well; that a "Westeros World" could be eventually introduced into the other HBO series. Of course, Nolan and Joy were incredibly flattered, but ultimately chose to pass on the idea. Joy felt that she needed to keep that world alive in her mind, dragons and all, and that incorporating Game of Thrones into Westworld could rob her of that. Viewers may be disappointed, but is there really any harm in wanting to believe that dragons are real? Fans of both shows will know that Zach Braff appeared on Arrested Development and that Jason Bateman showed up on Scrubs. Although the actors may have crossed over from one series to another, the characters did not. However, Scrubs creator Bill Lawrence and star Zach Braff had hopes of bringing Tobias Funke into Sacred Heart Hospital. Both were huge admirers of David Cross’ work and thought that a guest spot from Tobias would be a great idea. This was long before resurrecting Arrested Development was even considered a possibility - it had only recently been canceled - and viewers likely would’ve welcomed a Tobias cameo on Scrubs. Alas, the fact that the shows were on two different networks proved too big a hurdle and the episode never came together. Stargate SG-1 aired on Showtime from 1997-2002, but switched to the Sci-Fi Channel for its remaining five seasons. Dark Matter ran for three seasons - after the network had rebranded as Syfy - from 2015-2017. The co-creator of the latter (Jeff Mallozzi) had previously worked on the former, giving him an idea of how he could potentially prevent Dark Matter’s early demise. A crossover between that series and Stargate SG-1 was meant to not only buy Dark Matter a fourth season, but also to potentially make room for new SG-1 content as well. Both would’ve aired on MGM’s streaming platform, Stargate Command. According to Mallozzi, time was not on their side and the project was ultimately undone by existing contracts. Doctor Who has tremendous crossover potential and there was a point when it almost shared the screen with Harry Potter. Concerned that the 2008 Christmas special would not live up to the prior year’s - which had featured Kylie Minogue - former show scribe Russell T Davies offered a magical pitch. His idea: J.K. Rowling would contract some sort of space illness that caused her creations to become a reality. The good Doctor would have to find a way to once again confine them to fiction. Rowling had previously been given the opportunity to pen an episode, but declined the offer. Davies thought that perhaps she might be willing to appear as herself instead. Apparently, David Tennant never quite warmed up to that idea. With no support from author or actor, the crossover plan was scrapped. As previously stated, throughout its 14 season run, Supernatural has never shied away from taking risks - which is why the show appears on this list several times. Once upon a time, the Winchesters once almost crossed paths with the Salvatore Brothers. Apparently the Supernatural team approached Julie Plec and Kevin Williamson with the idea that these two worlds would find a way to collide. Plec and Williamson felt that, although both shows were supernatural in nature, the worlds were simply too different. In retrospect, Plec thinks that it could’ve been fun, but at the time, TVD was only in its early days. There was still so much work to be done to fully flesh out Mystic Falls, and incorporating elements from Supernatural’s already established mythology probably just seemed like too much to handle. The fifth Die Hard movie wound up with the title: A Good Day to Die Hard. That wasn’t the case at first, though. The film was initially going to be called Die Hard 24/7, because 24’s Jack Bauer was going to be meeting up with John McClane. It’s unclear how far development had gotten on the project before Kiefer Sutherland backed out, but it was rumored that he did so to focus solely on 24. 24 did eventually find new life in the form of a television movie, limited series and a revival - sans Sutherland. There’s no word on how McClane and Bauer would’ve met, but it seems likely now that they never will. The end of Gossip Girl season two featured what was meant to be a backdoor pilot for a spinoff about Lily Rhodes and her sister Carol as teenagers in 1980s California. Despite its cast of Brittany Snow, Krysten Ritter, and ‘80s heartthrob Andrew McCarthy, the show wasn’t picked up. Josh Schwartz and Stephanie Savage had focused on the East Coast with Gossip Girl, but prior to that, The O.C. saw them spinning stories about the West Coast. When plotting the GG spinoff, they considered having Lily and Carol cross paths with a young Kirsten Nichol and her then sweetheart, Jimmy Cooper. Perhaps present-day Orange County natives could’ve eventually found their way to the Upper East Side as well. Sadly, the CW passed on the series and we’ll never get a showdown between Blair Waldorf and Summer Roberts. This idea won’t be a surprise to any Marvel fans, considering how much sense this crossover would’ve made. Of course, this was pitched well before anyone realized just how awful Inhumans would actually turn out. Agents of S.H.I.E.L.D. started out as fairly mediocre, but quickly improved and, in the opinion of most who stuck with the show, has only gotten better with each passing season. However, the series was never just plain bad. Showrunner Scott Buck had admitted that while Inhumans was launching as its own entity, an eventual crossover was obviously not out of the question. If the series had survived, it seems pretty clear that Marvel would’ve seen fit to find a way to connect it to AoS. As it stands though, the Royal Family never even made it to season 2. Long before Jodie Whitaker became the first female Doctor, fans were crying out for some sort of Sherlock/Doctor Who crossover. Sherlock co-creator Steven Moffat also happened to be a writer and producer on Doctor Who, a fact that was not lost on viewers. Moffat had stated that he would be onboard for these two fascinating figures to meet, but that no one else working on either show really wanted this to happen. Moffat may have loved the idea, but his fellow Sherlock creator Mark Gatiss was positive that fan excitement would quickly be replaced with disappointment. Gatiss is not into mashups of this kind in general, but he also feels that the shows are just two different to find a sensible way to put them together. 30 Rock and Parks and Recreation are two of TV’s most beloved sitcoms. Ever since they went off the air, in 2013 and 2015 respectively, viewers have been clamoring for them both to return in some form. When asked if there was any word on a 30 Rock reboot or revival, Tina Fey had no new updates. She did, however, have the best idea ever. According to Fey, Amy Poehler is ready for a reboot of Parks and Rec, so why not just do a spinoff centering on Liz Lemon and Leslie Knope? It’s likely that there are few fans of either show out there who wouldn’t love to see this happen. Surely, these two brilliant women could figure out a clever way for their television counterparts to meet up onscreen. Alas, Fey was likely just toying with our emotions. Although it’s often the Supernatural team that comes up with the crazy crossover ideas, in this case it was Diane Ruggiero-Wright. Along with Rob Thomas, she developed iZombie for television and had the thought that some sort of event involving the Winchesters would be really cool. The crossover may have indeed been awesome, but it was quickly pointed out to Ruggiero-Wright by another showrunner that there was absolutely no way for it to happen that would make any kind of sense. Although the shows are certainly both supernatural in nature and even share a somewhat similar tone, the major differences are in a whole lot of details. Plus, would fan favorite Blain even manage to survive if Sam and Dean showed up in Seattle? We doubt it. Fans have long noted the similarities between Star Trek: Deep Space 9 and Babylon 5, which were both airing at the same time throughout the ‘90s. This is a rather strange case in that it wouldn’t have so much resulted in an actual crossover, as it would’ve meant that Babylon 5 could’ve been set in the Star Trek universe. Although DS9 hit TV screens before B5, J. Michael Straczynski actually pitched his idea for the latter before the former ever went into production. He brought it to Paramount, which passed on the project, but shortly thereafter began developing something similar. Straczynski has stated that he doesn’t believe that the creators of DS9 intentionally ripped off his work, but that he wouldn’t be surprised if those privy to his original pitch helped steer them in a certain direction to begin with. Although CBS’s The Incredible Hulk enjoyed a long and successful run, the show’s contemporary The Amazing Spider-Man was canceled after a mere thirteen episodes and has been largely forgotten. Even Stan Lee himself wasn’t a fan. However, Bill Bixby (Bruce Banner) got in touch with Nicholas Hammond (Peter Parker) to discuss the potential for a 1984 TV crossover starring both heroes. Hammond liked the idea, hopeful that it would redeem his live-action iteration of Spidey. It would seem that the project was a go, but one can't really plan a Spider-Man/Hulk special without someone to portray the Jade Giant. Apparently, Lou Ferrigno was unavailable, so the project was scrapped before it had even truly begun. Donald Bellisario has been responsible for creating many popular shows over the course of several decades, including Magnum P.I. and Quantum Leap. The latter debuted not too long after the former ended its successful eight year run. However, while it was undoubtedly critically acclaimed, Quantum Leap was never as popular as the Tom Selleck series. In an effort to boost ratings, the plan was to have Beckett “leap” into Thomas Magnum. Although the plot development was announced by NBC, it would appear that the network failed to actually get the go-ahead from Selleck. Whether due to Selleck’s lack of commitment or to the theory that Bellisario had received interest in a movie based on the show, the episode never wound up happening. A spinoff centering on Leslie Knope and Liz Lemon obviously makes perfect sense, but Parks and Recreation spinning out of The Office is easy to see as well. This was initially considered, but there was just one problem: Rashida Jones. The actress had portrayed Karen Filippelli on The Office before being cast as Ann Perkins on Parks and Rec. That wasn’t the end of the discussion, though. The idea was floated that a copy machine on The Office would breakdown and wind up being impossible to repair, so it would land in a warehouse to be refurbished. Once that was completed, the machine would be loaded on a truck to travel to its new home in the Parks and Recreation office of Pawnee. In the end, the decision was made to just keep the shows separate. Season 5 X-Files episode “Bad Blood” may have become a fan favorite, but the original idea for the installment was completely different. The plan was to frame the episode as an installment of Unsolved Mysteries. Robert Stack would’ve hosted, of course, and Mulder and Scully would have been portrayed by two different actors for the duration of the story - Gillian Anderson and David Duchovny were actually super excited for a week off from shooting. Ultimately, the crossover was undone by the fact that X-Files scribe Vince Gilligan simply couldn’t make it work on paper, although he loved the idea in theory. Without much time left before the episode needed to be shot, the writer created the vampire-centric “Bad Blood” instead. The Winchesters are all about family - well, except for poor Adam. When Bobby found himself trapped in his nightmares during season 3 episode, “Dream a Little Dream of Me”, Sam and Dean went into the dreamscape to rescue him. Remember the sequence that revealed Dean’s immense desire to settle down with Lisa and Ben? Well, he almost shared the screen with Jason Voorhees instead. 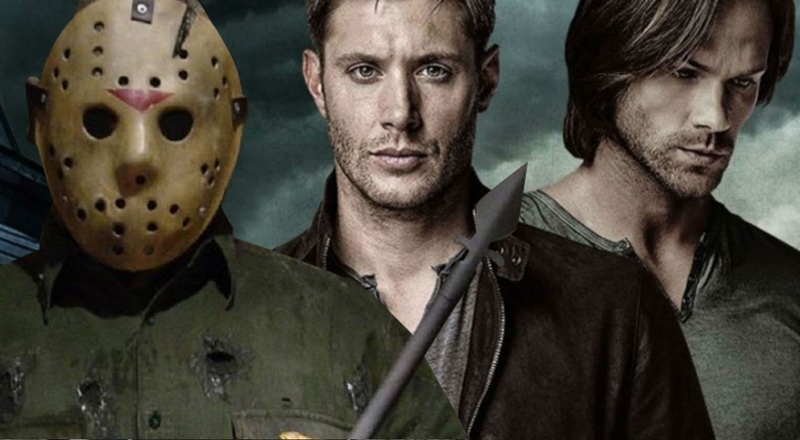 In the season 3 DVD featurette, creator Eric Kripke revealed that his initial plan was for Dean to face off against the Friday the 13th psycho in a scene modeled after the ‘80s slasher classics. Unfortunately, the studio who granted them permission to use the character realized too late that they didn’t actually own the rights at all. Do you wish that some of these canceled crossovers had become a reality? Let us know in the comments!